The book is not at all “micro” in size but the detailing is at such a “micro” level that we actually start imagining the micro as macro and shudder (at times). A fantastic and spell binding read, for sure. The story starts with a very strange occurrence of events where 3 people are killed with deep cuts all across their bodies and no one has a clue what caused those deep cuts. The story starts taking grip right from the page 1, line 1. A group of young scientists (From Massachusetts) are introduced to a budding venture named “Nanigen Micro Technologies” (a venture by a sharp as well as wicked minded Vincent Drake and intelligent and beautiful Alyson Bender). Eric, brother of one of the young scientists, is also a major part of this venture. These young scientists are asked to work for Nanigen and are invited to visit the office in Hawaii. The visit turns out too adventurous. Eric is then murdered by Vincent Drake, because Eric knows too much about the black works of Vincent to be alive. Alyson Bender helps Vincent in killing Eric. Peter, brother of Eric and one of the scientists, comes across a numbing fact that his brother hasn’t gone missing but is murdered. And since that time he sets himself on the mission of prosecuting Vincent and Alyson. But the events take unexpected turn and they (all the scientists) are exposed to “Tensor Generator” (a machine that miniaturizes anything to micro level) and are then the small creatures left on their own in the wildness of Hawaii jungles, which are also lab to Nanigen Technologies. The whole story henceforth of the scientists in the wilderness of those jungles, where they are even smaller than the fire beetles and ants, is indeed a spellbinding. You keep on turning pages one after the other and your eyes are glued to the pages. Nothing can take your mind away from the storyline until you finish the book, or let me say till 75% of the book is finished. Let me tell you the reason behind why I said until 75%. Michael Crichton, as we all know, is the author of another such sci-fi novel which is even converted into a movie called Jurassic Park. Hence we know he’s a man of immense story telling capacity. So coming back to main point, Michael Crichton died before the book was finished, at around 75%. 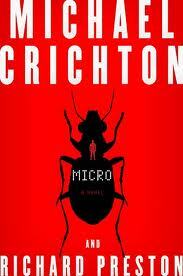 Hence another author, whom Crichton might have asked to finish the book, Richard Preston finished the book. The story telling methodology of both differs largely and hence you will also notice a shift in capturing capacity of the book. Nothing to take away from Preston, but frankly he’s no match to the abilities of Crichton. But overall the book is an awesome read. The anxiety of fight between Micro-Scientists and the threatening, overpowering nature and its micro creatures is really spine chilling at times. My advice will be DO READ THIS BOOK.